Gardeners usually grow gladiolus as a summer flowering bulb in the garden. 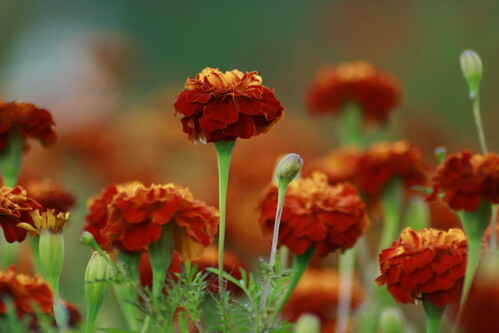 Prized for its brightly colored flowers, blooms come in nearly any color except blue. While usually grown outdoors, you can grow gladiolus bulbs indoors in pots. Since gladiolus is a tender bulb that does not tolerate cold temperatures, growing it in pots allows you to protect the plants over winter so that they return to bloom each year. Start the corms indoors in spring or early summer. Gladiolus produce many flowers along single flower stalks. Fill a 10- to 12-inch flower pot with a quality potting soil. Fill the pot to within 2 inches of the rim. 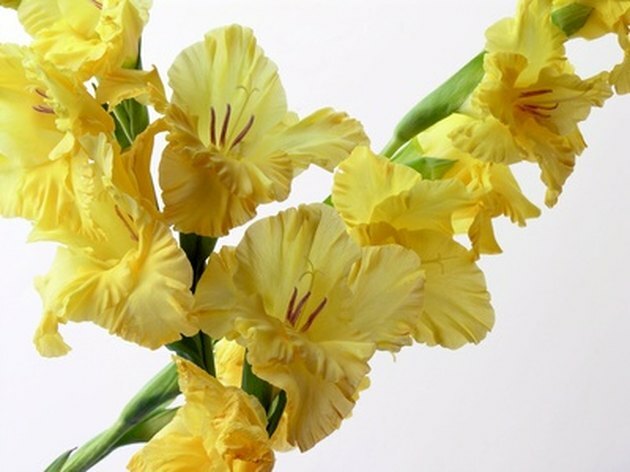 Plant the gladiolus bulb 4 to 6 inches deep. Space bulb 2 to 4 inches apart in the pot. Plant large, or jumbo, bulbs deeper and farther apart and plant the smaller bulbs at the shallower and closer measurements. Water the soil after planting. Add water until the excess moisture drains from the bottom of the pot. Place the pot in a warm window that receives at least eight hours of sunlight a day. A south or east-facing window is preferred. Water when the soil surface begins to feel dry. Add water until the excess drains to ensure the soil is evenly moist, then empty the pot's drip tray so that the plant does not sit in standing water. Fertilize gladiolus bulbs after flowering and again each spring once they begin to actively grow. Use a nitrogen-rich houseplant food, following label application instructions.